Name: Patronymic from Welch "Ap-Rice" -- Son of Rice. The surname was recorded in Merionethshire where they were seated from ancient times. Shield: Silver lion rampant of a field of red. History: Our links to the Price Family are through Zetta's mother, Nannie Mae Price, and her father's grandmother, Mary V. Price of Knox County, Tennessee. Large Price families are found throughout America. They came from Wales originally, where they were contributed many statesmen and warriors. Captain John Price was the first in America and landed in the Maryland Colony. & Phillip Price settled in the Pennsylvania Colony, and John Price was a member of the Jamestown Virginia Colony; he is the progenitor of the largest Price family and the common ancestor of most Prices in Kentucky and surrounding southern states. 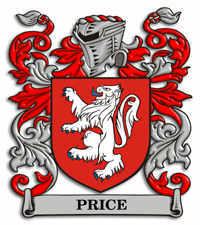 His descendent, Calum Price, sired a Thomas Price in 1738 in Culpeper County, Virginia. Thomas lived at Elk Garden for a while, then he enlisted in Captain John Lewis' Company of Augusta County, under Colonel Charles Lewis' regiment, a nd fought the Indians in Lord Dunmore's War in 1774 at the Battle of Point Pleasant. He fought in the Revolutionary War, and was at the battle of King's Mountain on October 7, 1780. After the war, he and five sons came to Kentucky. Although Thomas and sons William and John moved on to Posey County Indiana, the other sons remained in Kentucky. Cullum Price, born 1782, settled in Esitll County and farmed. His descendants in our line include Adam Price, Henry Price, and Thomas Price, all of Estill/Lee County. Henry Price enlisted in the 32 Ky Infantry during the War Between the States.